The reason I disliked this book previously, and therefore kept putting it down, was because I really don't like Alcott's view and method of child rearing. Every time I get to the part where Amy was punished in school and runs home to cry about it and is promptly defended by her mother and sisters, I close the book. This time I didn't open it intending to re-read that part but instead picked up where I left off. By that point in the story, all discipline issues of that nature seemed to have been dealt with and I enjoyed the rest of the story -- and very much at that! Meg - In want of a good husband and desperately unsure of how to get one when she thinks there's a possibility. Jo - No use for females; total tomboy. Amy - Spoiled good-for-nothing who gets the only guy worth getting (and it never fails to irritate). Meg - Is total sweetheart. She has a teachable spirit. She wants to be a good wife and mother and does what the Bible instructs -- to seek the advice and counsel of an older, more experienced (and successful!) mother. I liked the fine line that Alcott walked between allowing Meg to have a deep, heartfelt relationship with Marmie after she was married, but which also had the two respecting the bonds of marriage. Marmie seemed very careful not to try to be Meg's spouse, but encouraged her daughter towards her son-in-law in a very artful manner that I found quite refreshing and respectable. Beth - Is every bit a human as the movies do not allow her to be. She's not someone who holes up with her piano, desperately avoiding the world. I liked how the book allows her death to be slow and lingering. We see her embrace the end and her family's happiness even though she knows that she will not be allowed to experience a long life, like that of her sisters. Yet still, she doesn't let that keep her from living a full life. And she does not hide in the shadows so much as she sees the needs around her and even in her pain she reaches out to the community to give and share from a heart that is very full. She is my favorite character. Pain did not stop her from development and maturity. She smiled through the pain, mourned her suffering, and rested in joy. Admirable. Truly remarkable. I am still not really sure how I feel about Marmie. At times I thought she was wisely overbearing, if that makes sense. She was almost too perfect to be real and therefore got in the way of my enjoyment sometimes. Thankfully she was kinda tucked out of sight until it was time to show the girl's emotional attachment to their mother. It was a very lovely relationship for the girls to have and Marmie had the blessing and benefit of having her offspring rise up and call her blessed. I liked the book's ending in that regard. It sealed her as a somewhat likeable character in my mind instead of my wishing that she hadn't been around quite so much. She was a bit too "right" to be believable. I guess my encouragement would be -- do not stop at Hollywood over this one. You'll end up mad at the wrong characters and liking things for the wrong reasons. This requires a bigger, fuller picture in order for you to truly appreciate Alcott's story of these four sisters. I'm glad I took the time to give this another try. But what next? I suppose I shall go on saying I like poetry next! Good heavens! SO glad you gave it a chance! I love the conversations throughout: there is so much deep, solid, through-provoking thought in this book that is presented so simply and understandably. Amy is definitely my fave. You're right, she comes across as spoiled in the beginning, but oh my how she grows. I love how she strives to improve herself, and at first just ends up being ridiculous (and don't all young girls put on airs of one kind or another?) By the time of the church fair, she is really and truly striving to be kind and gracious. I do love her conversations with Laurie in Part 2. The sensible way she sizes him up and reproves him for lounging is so dead on. He needed a good talking to. And you're right, all the movies have fallen so short! Yes, Marmie irritates me a bit too. Also, the presentation of the Civil War is of course slanted, as to be expected. Also, you don't really get much of the underlying philosophy in this book, which is helpful if you're trying to look at it as a good book. 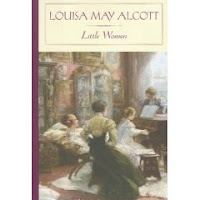 In real life, Louisa May Alcott sneered at her moralistic tales (this one and others in the series) as "moral pap for the young," and had far more interest in the lurid, sensational novels she wrote (whereas in the book, she uses this writing as a moral device that the character, Jo, grows out of and repudiates). Very interesting worldview conflicts there. This is one of my Favourite books of all time. I am going to re-read this sometime soon! While none of the movies do the book justice, my favorite movie is an old one starring June Allyson as Jo and Elizabeth Taylor as Amy. Great review. I read this book a second time as an adult and absolutely LOVED the frequent references to one of my favorite books, Pilgrim's Progress. I appreciate your review! I didn't read this book until I was given it in college. But oh how I enjoy it! I sympathize with your incredulity towards Marmie: she seems unreal-ly perfect. And I confess for general abuse that I have never liked Laurie! But you made me want to read this book again. I just finished this for the first time a couple weeks ago and loved it immensely. I actually underlined most of Marmie's advice to her girls, having known some women just as great. Hopefully I'll be as wise as she is the more I struggle with and overcome my own faults as she did. Thanks for the great review, you gave me more to think about.